Lillie A. Estes, a Gilpin Court resident, unveiled the Charles S. Gilpin Community Farm site plan on Martin Luther King Day 2018. A vacant lot on St. Peter Street blighted the Gilpin Court neighborhood for decades. Overgrown grass invited debris. The location supported crime. Most residents paid little attention to the lot until Lillie A. Estes recognized its potential as an urban orchard and garden. Estes began networking with residents, conveners and funders. Virginia LISC (Local Initiatives Support Corporation) offered technical assistance and guidance, plus funding. Storefront for Community Design facilitated pro bono access to landscape-design resources. Neighborhood meetings were held by the Gilpin Court Tenant Council, which touts “unity in the community,” and residents voted to take active measures to improve their community and safety. Estes collaborated with the Department of Parks, Recreation and Community Facilities (PRCF) to designate the Gilpin Court lot as a community garden site. 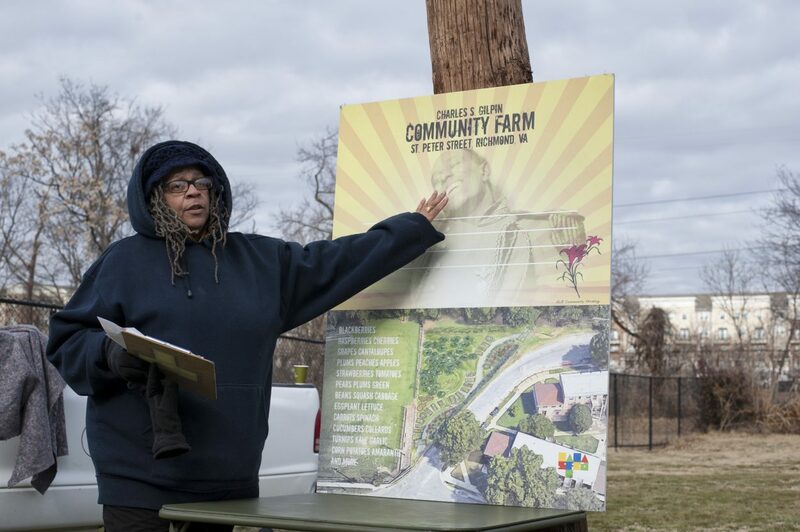 She envisioned naming it the Charles S. Gilpin Community Farm in honor of the Richmond native revered in the 1920s for his acting skill and advocacy for fair treatment of black actors. A volunteer architect developed the preliminary site plan for the urban greening project based on community feedback. The central area was reserved as an informal gathering place, and raised beds were recommended for growing of vegetables, ranging from traditional beans and kale to garlic and amaranth. Another key partner, Lewis Ginter Botanical Garden, suggested an urban orchard with apples and various berries. After years of organizing and methodical planning, the first community launch was held earlier this year on Martin Luther King Day. Subsequent work days were led by Duron Chavis, Lewis Ginter’s community engagement manager, and the Ginter Urban Gardeners, who share skills for increasing community-supported green spaces in urban areas. An estimated 30 adults and youth showed up to help, including middle school students affiliated with the Richmond Peace Education Center. The youngsters’ decision to take part followed a number of violent deaths in the Gilpin Court neighborhood. “These youth are peacemakers for change in their community,” said Rasheeda Edmundson, the Peace Center’s youth peace teams director. “Their involvement came out of tragedy, as a platform where youth could share concerns and heal among each other.” In addition to supporting the community garden, the students have attended conflict resolution classes and held healing circles and yoga classes to promote community. They also have entertained neighbors with junkyard jams, where buckets used as drums provided stress relief through a healing beat. LaFonda Page lived in Gilpin Court as a teen, moved away and later returned with her family. Her apartment overlooks the Charles S. Gilpin Community Farm. “It gives me and my five kids a view with trees, plants and artwork,” she said. The latter, attached to the fenceposts, are oversized stencils of a cantaloupe, carrot and sunflower created by children through PRCF. This article first published in the Richmond Times-Dispatch in October 2018.